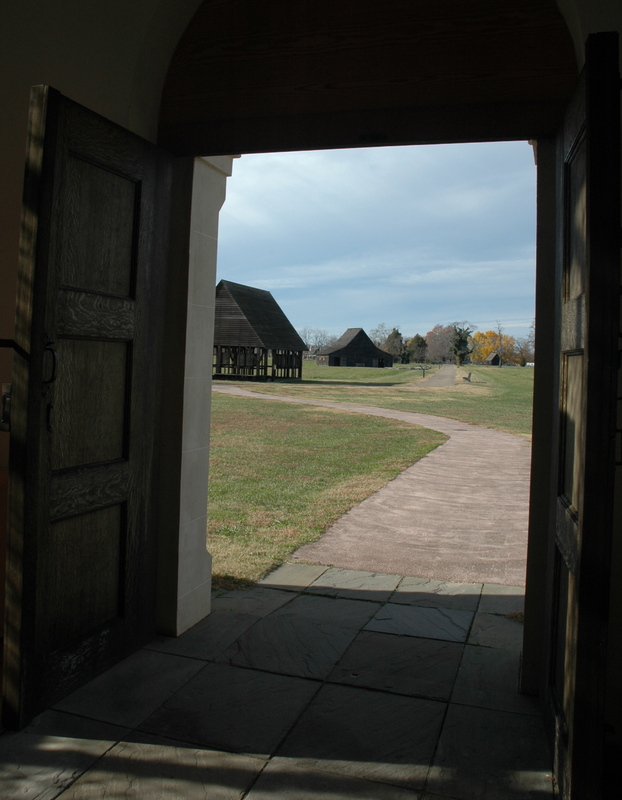 From the doorway of the reconstructed brick chapel.The structure in the background, with the curved roof, is the oldest wooden barn in Maryland. Photo: Margaret Yocom, 2013. Welcome to Maryland’s first capital, the place where Alexander Magruder first put his foot on American soil. These photos are from a visit in November 2013, in company with my friend and colleague the folklorist and photographer Margaret Yocom. St. Mary’s City, founded in 1634 by Cecil Calvert, the second Lord Baltimore, was Maryland’s first capital, laid out on an existing town site and farmlands purchased from the Yoacamaco tribe. You could say the first buildings of St. Mary’s City were the Yoacamoco witchotts in which the colonists survived their first winter. Many of those native buildings continued in use, even as colonists began to construct their own dwellings, sheds, and public buildings. On paper, St. Mary’s City was laid out in imitation of Italian Baroque city plans, with the town center located at the intersection of two long triangles. At the far edges of those triangles were built, respectively, the State House and the principal chapel. This type of city plan was part of the Catholic heritage; but note how it also symbolizes the ideal of the separation of church and state, with commercial interaction at the center point. Though the plan for St. Mary’s City was grand, in reality the city was never more than a sprawling mix of shacks, wood-frame houses, taverns, and docks, marked with a few substantial buildings of locally-made brick. Today’s footpaths through the site follow original streets. Abandoned after 1695, when the capital moved to the new city of Annapolis (one of several political moves designed to dis-empower Catholics in the colony), the site of St. Mary’s disappeared from the landscape, its buildings torn down and bricks used for new structures, its land converted to farmland. This erasure was never absolute, as artifacts surfaced routinely under farmers’ plows, but it was fortuitous: in the late 20th c., when archaeological investigation began in earnest, nothing lay over the ruins but soil and sod. Everything below the plow-line was intact, including foundations, streets, and the trash piles so valuable to archaeologists. Today, Historic St. Mary’s City is recognized worldwide as a premier 17th c. archaeological site. Though expense prohibits reconstruction of more than a handful of buildings, projects undertaken are meticulous. Wooden buildings stand in the exact post holes of their predecessors and are built of the same materials and by the same methods used by the early colonists. Reconstructions of the few large brick structures are based on contemporary descriptions, plus analysis of comparable contemporary buildings in Europe and the other American colonies. Foundations indicate the thickness of the walls, for example, which in turn yields an approximate height of the walls. Study of the style and function of similar buildings elsewhere helps architects choose details and design plausible replicas of Maryland’s vanished treasures. The Historic St. Mary’s City Commission has stewardship of more than 850 acres. 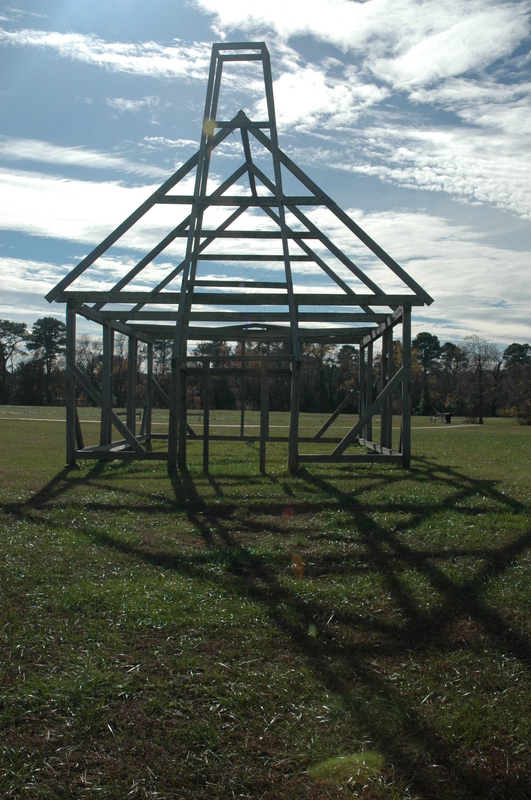 Their partner institution, St. Mary’s College of Maryland, whose students play a significant role in excavation and research, occupies another 275 acres that were also part of the early town. 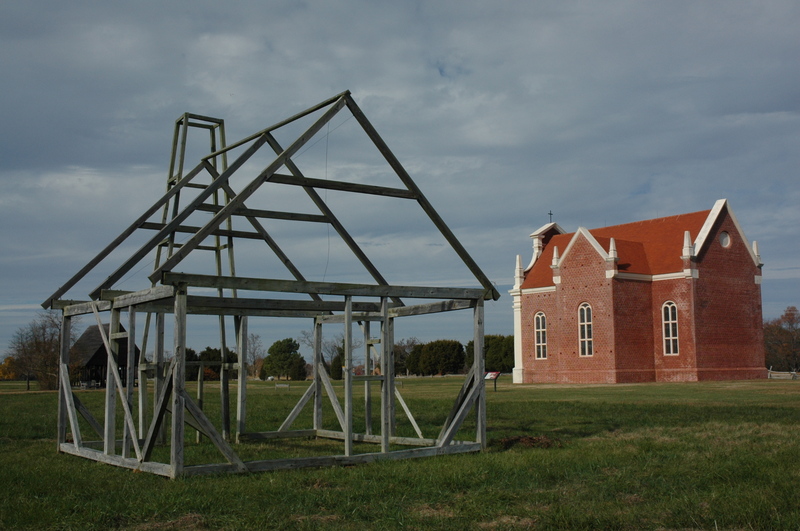 Reconstruction of the 1667 brick chapel, with the “ghost frame” of an unknown building in the foreground. As you may have guessed from the photo, “ghost frames” have been erected on the foundations of a few other buildings, to show their exact location and approximate height and shape. That tall structure on the ghost frame, by the way, isn’t a tower or steeple, but a chimney. We almost missed getting a photo of a reconstructed chimney, but in the next photo you can see one on the left margin. As you see, they weren’t built of brick, but of “wattle and daub”–dried mud over a wooden frame. Reconstructed buildings at the town center, including a typical “wattle and daub” chimney, at left. St. Mary’s City was never very populous. Early Marylanders were scattered over the landscape in small tobacco plantations, principally along the St. Mary’s, Patuxent, and Potomac Rivers. 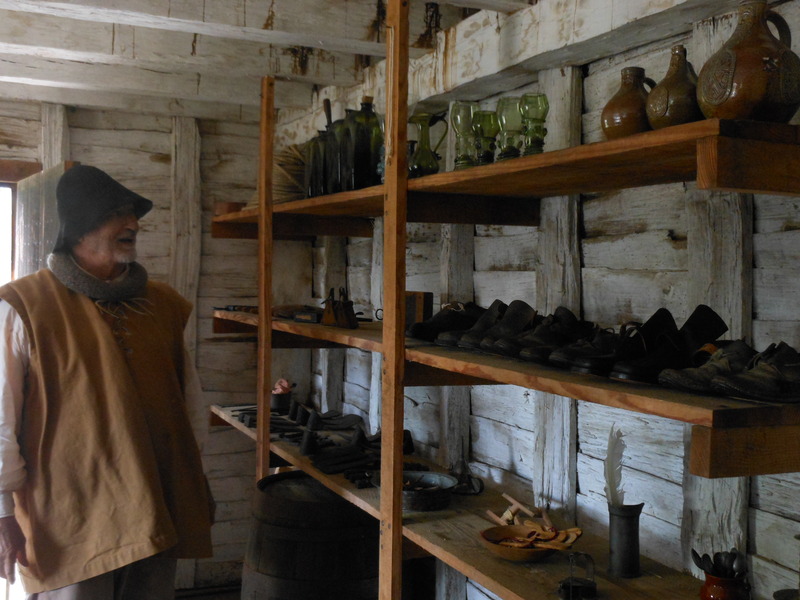 Some of the capital’s businesses opened only twice a year, when the State Assembly was in session, providing both practical and luxury goods to assemblymen and their servants, as well as to ordinary colonists who had business with the assembly. “Smith’s Ordinary,” an establishment described in historical records, has been reconstructed on its original foundation near the town center. An “ordinary” combined the functions of hotel, restaurant, and general store. Smith’s is not described as one of the finer establishments of the colony, but as a most ordinary ordinary. Smith’s Ordinary, St. Mary’s City, reconstructed as it was in mid to late 17th c. Photo: Margaret Yocom, 2013. All goods on these shelves–from shoes to pewter spoons to Venetian glassware–are replicas of actual objects uncovered in excavations of St. Mary’s City, including “face jugs” from the Netherlands, whose popularity later spread throughout the American south. 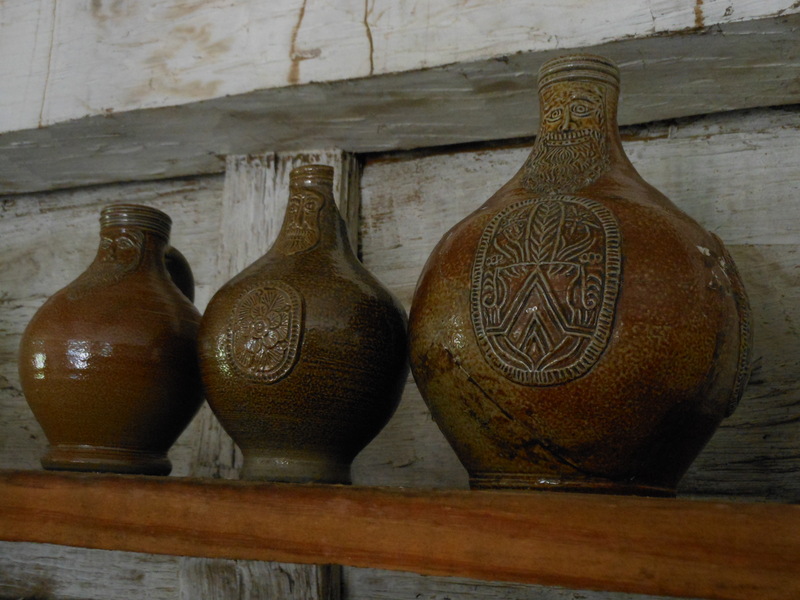 Replica face jugs, Smith’s Ordinary, St. Mary’s City. Photo: Margaret Yocom, 2013. 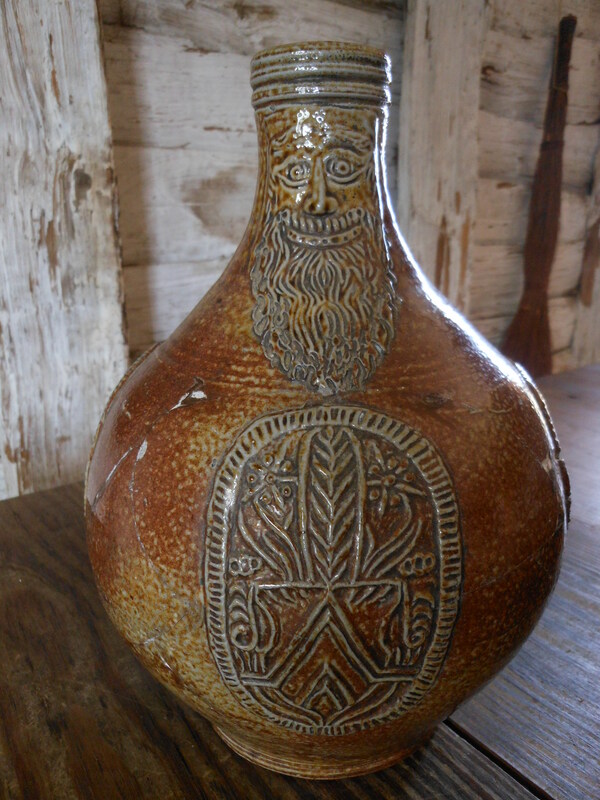 Replica face jug, Smith’s Ordinary, St. Mary’s City. Photo: Margaret Yocom, 2013.
the first printing press in the southern colonies, owned and operated by William Nuthead. The printer William Nuthead first immigrated to Virginia, but the governor, William Berkley, prohibited him from printing in that colony. Nuthead moved his press to St. Mary’s City in 1684 or 1685, and printed there for a decade. When the capital was moved to Annapolis, Nuthead followed to that new city. Despite this nod to the importance of printing and of reading, in the 17th c. only about half the colony’s population were literate enough to sign their own names and the colony’s business was conducted orally. This is one reason for the scarcity of early records. Even so, we can contrast Maryland’s early ideas and ideals with this 1671 statement by Virginia’s Governor Berkley: I thank god there are no free schools nor printing, and I hope we shall not have these [for a] hundred years, for learning has brought disobedience, and heresy, and sects into the world, and printing has divulged them, and libels against the government. God keep us from both. and, finally, the Restoration of Charles I’s son, Charles II, in 1660. Got all that? I hope so, because, believe me, that is a very simplified version of events in a violent and chaotic period of Scottish, English, and, by extension, American colonial history. The history of Maryland from 1634-1660 is also the history of religious conflict and of the Civil Wars. Battles fought here often involved Native Americans as proxy or adjunct armies for the Calverts’ infant colony in Maryland and various Protestant and Puritan forces arrayed against them. When you read that Alexander Magruder was transported to Maryland as a prisoner of war, probably in a shipment of 150 Scots prisoners who arrived in St. Mary’s City in January, 1652… plug that idea into this timeline of world-changing events. Alexander’s family were tenants and high-ranking servants to the Drummond family in Perthshire, who were early and prominent Protestants. There is no reason to believe Alexander was a Catholic, and many reasons to believe he was not. At various points in the Civil Wars, the Drummonds raised regiments from their tenantry in support of the Covenant cause. They also were prominent in raising troops to resist Cromwell’s invasion of Scotland after the regicide. Alexander’s father (also named Alexander) was Chamberlain to James Drummond, the Earl of Madderty. Alexander’s elder brother, James Magruder, was Chamberlain to the highest ranking Drummond, the Earl of Perth, and represented him on a committee of war preparing for Cromwell’s invasion. No records survive to tell us what Alexander the Immigrant was doing at that time, nor where and how he was captured. At the battle of Worcester in 1651, a regiment commanded by Lord Madderty’s brother was defeated by Cromwell’s troops and many Perthshire men were captured. It seems most likely to me that Alexander was with this regiment. In a time of such deadly strife between Catholics and Protestants, as well as among different Protestant sects, the fact that Maryland had no state religion was a radical and dangerous idea. This did not mean that early Maryland had freedom of expression as we conceive of it today, but, rather, a policy that held religious matters to be private, not linked to political loyalties or public affairs. The idea of a secular state, and the Toleration Act itself, were part of a survival strategy for Lord Baltimore and other Catholic leaders. Though today we think of Maryland as “a Catholic colony,” Catholics were always a small minority here–even on the first ships to arrive, under Lord Baltimore’s flag–and they always struggled for political and personal survival. Public Catholic worship remained illegal here, just as it was in England, though in 1641 a group of Jesuits defied this ban and built a public chapel. Recent archaeology suggests that this structure was on the site now called “the Priest’s House,” a large wooden building with living quarters for priests with a large adjoining room for worship. The photo below shows a “ghost frame” indicating the exact site and approximate size of the Priest’s House. Near that early building stood the brick chapel pictured near the top of this page, built in 1667, in a period of increased toleration under the restored King Charles II. 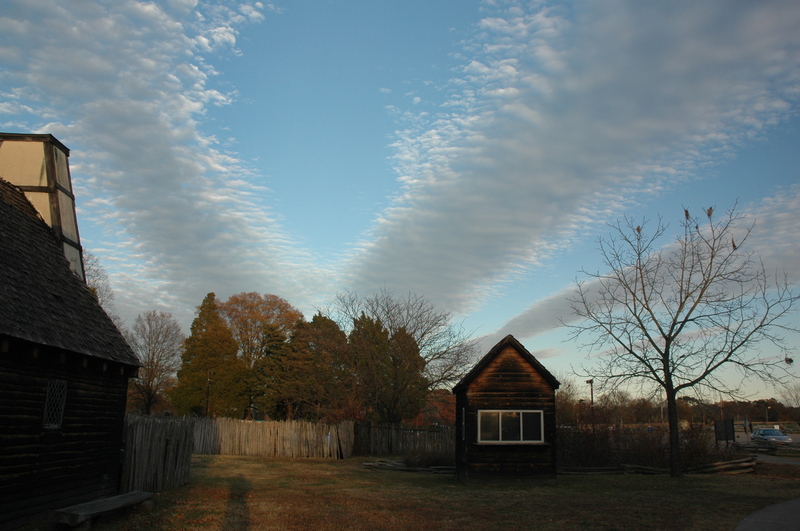 Ghost frame of “the priests’ house,” probably the site of Maryland’s first public place of worship for Catholics. Read more at Historic St. Mary’s City and in this Bay Journal blog post. If you can’t visit, the next best place to start is “…once the Metropolis of Maryland: The History and Archaeology of Maryland’s First Capital, a brief but excellent (and well illustrated) introduction, available by telephone or email from Historic St. Mary’s City website. Click on “Shop” to find the contact information. For sorting out the history of the Civil Wars, nothing beats David Plant’s British Civil Wars Project. My sources for early Maryland history on this page also include Russell R. Menard’s Economy and Society in Early Colonial Maryland; David B. Quinn’s Early Maryland in a Wider World. For full citations for these and other sources, click on Sources at the top of any page on this site. For detail and sources on Alexander the Immigrant’s origins, see other blog posts and pages on this site, including Alexander, McGruder / McGregor / Campbell / Drummond: Are you confused yet? , Alexander’s Family Tree, and Was Alexander Who We Think He Was? If you enjoy interactive graphics, you may like Maryland Public Television’s Exploring the Roots page of early Maryland history, including the founding and growth of St. Mary’s City. Susan, even without the Magruder connection, your posts and Ms. Yocum’s photographs are worthy of The History Channel! Bravo! Thanks, Liz! I’ll be sure to pass on the compliment to Peggy Yocom. Her photos really anchor the story. Where could a person find a list of the people who settled St. Mary’s city? I would contact Historic St. Mary’s City and/or the history department at St. Mary’s College.